Okieladybug's Scrap N' More: My "Tea"rific Friend! 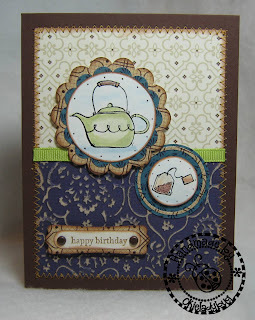 When I saw the Morning Cup stamp set in the Stampin Up catalog I knew I would be getting it! I did indeed get it at the last SU party I went to but just now got time to use it *okie isn't sure where her time goes but thinks her time has a habit of running away*. There are several really cute stamps in the set but for this card I am going with the tea kettle and the tea bag. 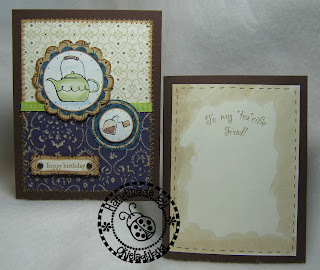 There is a sentiment stamp in the set that does say "tea"rific and that is where I got the idea for the inside sentiment. I did have a hard time thinking of how to make a cute layout for the card and then I gave up and just used this one. I ran the purple cardstock through the Cuttlebug and then left it on the folder to sand. 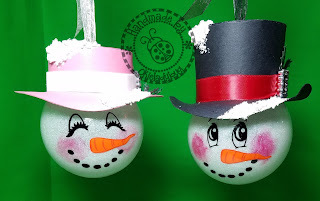 This method keeps the embossed image from getting smashed while sanding. I then used the walnut ink to go over the paper to give it an aged look. I worked quickly and soon as I had it all covered I used a paper towel to dab off the excess. I think it added a nice background and didn't look as stark as just the white core would have. Notice the thin circle around the tea bag image. I did that by first punching with a 1.25" punch and then using a 1 3/8" punch and lining up the hole left from the 1.25" punch. 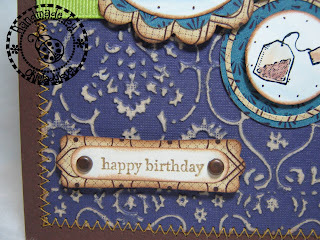 I used the Word Window punch for the happy birthday sentiment and then put it on top of some cardstock I had punched with the Modern Label punch. I added some brads for a little extra embellishment. I used mounting foam to then attach to the card. The inside sentiment was completed using the Hallmark Studio program. 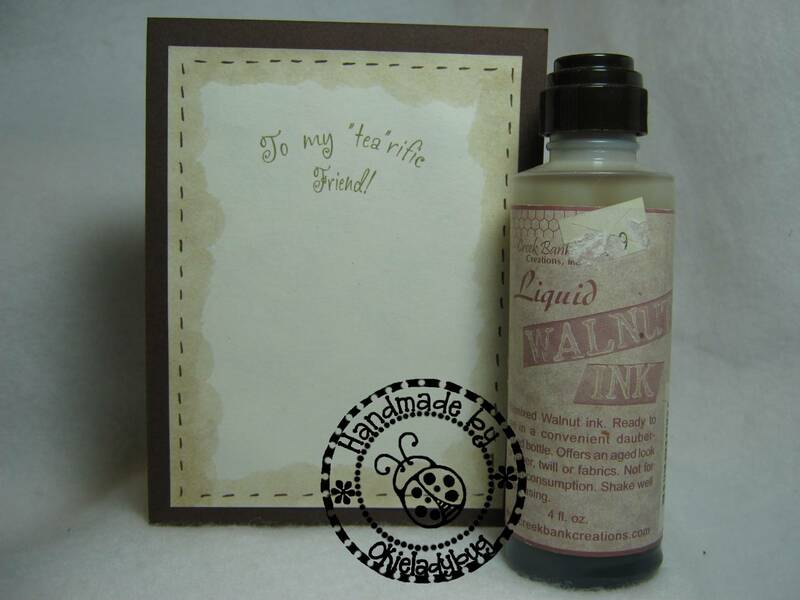 I used the walnut ink around the edges to give it a tea stain look *okie sighs and once again thinks she is such a genius*. I was on the phone with my friend Linda, aka LGuild, when I printed the inside of the card and guess what...I PRINTED IT THE WRONG WAY! So I had to print again *okie thinks there were her genius status down the drain...once again*. I added a picture of the ink because I figured you guys would be hassling me and asking me what it was and what it looked like. So now you know...and don't be hasslin me! *okie tries to give a mean serious look but cracks up laughin instead*. I bought this bottle a few years ago and a little goes a long long way. I think it was $4.99 when I got it. This is beautiful Okie. And, yes it does look like a lot of work went into it. Clever, clever girl! Hey I tried putting clear thread on my sewing machine last night and I just about went nuts. Is it easier with the Janome Mini than a more expensive sewing machine? 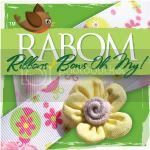 I love the idea of not changing the bobbin. That was an idea I got from you, right? Donna being from the south I am use to hearing "and what would you like to drink maam" and I respond "tea" and they say "sweet or unsweet". But up north I was asked "hot or cold". Linda not sure if it is easier or not. I know once it gets down toward the end of the bobbin when I am using it I start having problems. Really beautiful, Okie!! I have a coffee set that I may adapt to this design. Such a cute stamp set and wonderful card. Thank you for this new technique of using embossed images. I can't wait to try it. I love the card nd thanks for the tip on sanding the paper was still in the folder. That is a lot of work, but such a lovely card. Too funny -- I think your "genius status" is still intact! I LOVE the walnut ink technique! Now I'm on the hunt to find it! I wanna play with this! It looks gorgeous!!! 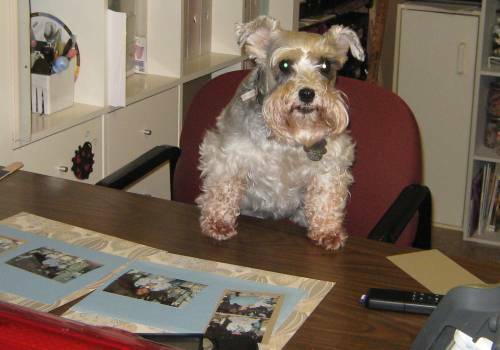 Boy did you put some time in this card! I love, love, love it! The colors are so pretty. Okie I love all the direction you give it is very helpful. You are wonderful and appreciated so much. I also love you humor. Thank you the card is so fun. I will give it a try. This is beautiful! I love tea too!